At a program this Wednesday, May 23, we’re exploring our modern-day obsession with and idolatry of technology. 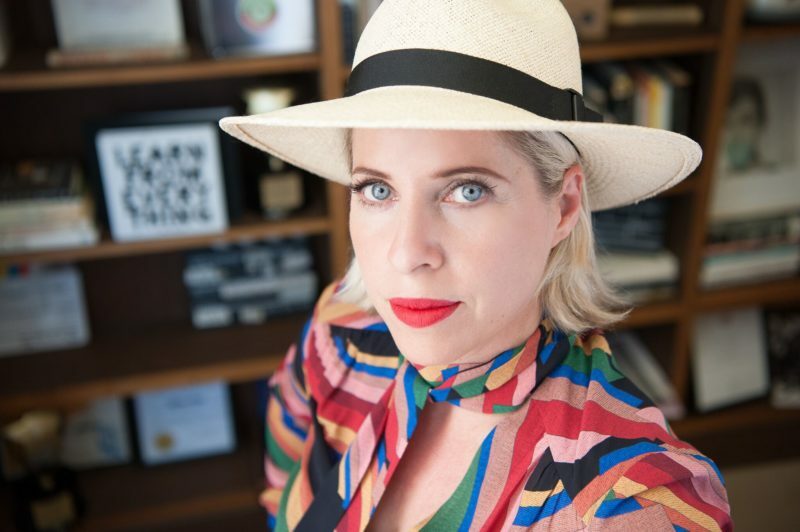 But I couldn’t wait until Wednesday to hear a bit from one of our panelists, Tiffany Shlain. Tiffany’s been thinking and writing about tech since the 1980s, and through her films and other work she explores how tech is developing, how we’re using it, and what that means for our lives and our minds. We talked about her early foray into the world of technology, and how weekly “Tech Shabbats” have changed her outlook on life. Check out our conversation below and then get your tickets to hear more from Tiffany when she’s joined by Nigel Savage and Rabbi Amichai Lau-Lavie on Wednesday. In what ways is our constant fixation on technology the same as worshiping the false gods of yore? And what can we gain from breaking the cycle and separating ourselves from our devices? Let’s find out together at 7PM. See you then! Chelsea: You’ve spent years thinking and writing about technology, its development, and its influence on our lives. What started you thinking professionally about this topic? Tiffany: Well I founded the Webby Awards in 1996. I was always into computers, I had the first Mac in the 80s, I was always interested in how technology was going to change our lives. And for the near-decade I was running the Webby Awards, I would start off each awards show by making a short film about how technology was changing the way we do everything. Then as soon as film was able to be shown on the web, I knew I wanted to combine all my work about the web with my filmmaking work. So I started a film studio in San Francisco, and one of the first films I made was calling The Tribe, which it explored American Jewish identity through the history of the Barbie doll. For that film, we did a lot of experimentation with discussing American Jewish identity. That was my first foray into film combined with a discussion kit to talk about how it’s changing our sense of identity and who we are. After that I made a film called Connected. My husband is a professor of robotics; we’re very interested in issues around technology. My father got very ill and I started to think a lot about how much time we were spending in front of the screen. Around the time that my father passed away, my family started doing Tech Shabbats so we turned off all screens from Friday night to Saturday night. We started doing it during Reboot’s first National Day of Unplugging which was almost a decade ago. And then we did it every week since because it was so meaningful for us. So that has been a continually meaningful experience and it keeps getting more interesting. I’ve made a lot of films and written a lot about what it’s like to go off tech once a week, with a teenage daughter, and all the lessons that we’ve learned from that. By going off of screens completely one day a week, it really helps you observe people on screens. And so it helps me look at these issues – what is technology fulfilling, what is the need, what is the addiction, what does it help, and what does it not help? What was happening in your life that caused you to implement these Tech Shabbats and take a break from technology and screens once a week? So you knew that time with your father was important enough to be present and focused and turn off your screens but we all forget that the rest of our life is important too. Right, and who knows how long we all have. Of course the other six days when I’m at my film studio, I do these global events, 50/50 Day which is about gender equality day and Character Day which is all about how we use the web to link people together and connect people all around the world to a single issue. So I am super interested in pushing the envelope with technology and then I also absolutely treasure and love this complete day off. You mentioned that when you were doing the Webby Awards, you would do videos on how technology had developed in the previous year. The 1990s was a lifetime ago as far as the internet and how we use technology today. When you were doing those videos, did you have feelings about the way tech and the internet were progressing that turned out to be way off? Or completely accurate? But then when I started the Webbys there were maybe 16 million people online and now there’s over half the population of the world – almost 3 billion people online. So the potential of what can happen….but of course technology is just an extension of us as humans. We’re good, we’re bad, and everything in between. So there’s also bad. I think people talk about technology as if it’s this ‘other thing’ that’s taking over our lives but it’s us. And we have agency to use it however we want, for good or for bad. And we can turn it off. And that’s a big message. I’m in New York right now working on a book about how interesting it’s been now, for nearly a decade, one day a week with these Tech Shabbats, to see how it makes me think about tech in different ways. You mentioned your daughter also doing the Tech Shabbats. She is maybe among the first generation of kids who have grown up with the internet from the very beginning. She looks forward to the Tech Shabbats. When we’re getting toward Shabbat she’s like “I can’t wait to go offline, and I want to do homework and post and like” and all the pressures teens feel. She’s been doing it for nine years, and then for my nine-year-old, it’s just a part of her life. But it’s been really interesting to watch because she has this unique viewpoint – everyone around her has grown up with it but she has this one day a week where she’s off of it and I think she really appreciates it. Do you get a sense that she’s able to take some of the messages of Tech Shabbat through the rest of her week? Oh yeah. About three weeks ago she went to this robotics thing on a Saturday and she couldn’t do the Tech Shabbat, and on weekends when I’m travelling and I can’t do it – you just feel so ungrounded. I need a day to replenish. I think that’s the way most people in the world are feeling right now – because no one else is taking a break! There’s no time to replenish. So once a week I get this full day to just reset. And I think our 24/7 society is not good for anybody. Do you still read the news, but just with a newspaper? I don’t read the news but I do read. I usually put aside things I’m really interested in thinking about. I do a lot of journal writing. It’s really reflective space for me. I’m just not in the hubbub and the stream of it all. It’s like this protected space. What’s your favorite analog, no-tech thing to do? I love writing in my journal, and I love gardening. I love doing art – painting, just putting my mind in another mode. In this short amount of time you’ve convinced me to do a Tech Shabbat. It sounds so refreshing. I am telling you, I feel like I’ve figured out some secret formula on how to exist today. Because it’s so overwhelming! We have to create a space to be more inward and reflective. We can’t just be reacting all the time. Right, it seems like you’ve figured out a secret way to live but it’s actually just the way everyone was living 20 years ago. It’s like we’ve come so far and now we feel like we need to fix things by going back to doing things exactly we way we used to. Yes, and going even further back, the idea of Shabbat is one of the oldest ideas around. And it’s a brilliant idea from so long ago. So bringing it back to idolatry, what are the things we’re worshipping? What are the false gods and idols today? It was very fun to work on the talk and I’m really looking forward to the discussion around it. Thanks again, Tiffany! We look forward to continuing the conversation Wednesday the 23rd!